Most people are unaware that as much as 75 percent of the population is suffering from chronic dehydration. This is perhaps because the symptoms of dehydration mimic so many other diseases and health problems. If you've heard it once, you've heard it a thousand times; Drink more water. This saying gets repeated so often that most people simply tune it out, but you shouldn't. When you think about all the life giving properties water gives us, it only makes sense that we should give the body all the water that it needs. You probably think that it's not rocket science, right? You feel thirsty, you drink some water. Did you know, however, that by the time you are thirsty, your body is already dehydrated? It's shocking, actually, when you find out just how important it is to stay hydrated. Let's take a quick look at what staying hydrated can do for you. Feeds the Body - For the nutrients in the food you eat to circulate to each part of the body, you need water. Think of food as a boat and the water you drink as the river it rides on. When the river runs low, the food gets backed up; which leads us to the next point. Flushing Waste, Toxins, and Bacteria - What goes in must come out, right? Our body naturally removes the bad things, as well as waste, by flushing it out with water. Sweat, urine, and waste all use water to work. Think of how backed up your own toilet would get if you didn't have enough water to flush things out - pretty disgusting thought, isn't it? Prevents Headaches - Most people do not realize that some headaches are caused by a lack of water. Next time you feel a headache coming on, chug a glass of water before you pop that pain pill and see if it goes away on its own. Lose Weight - The next time you feel hungry, try drinking a glass of water instead. Our bodies tend to send out signals that we misinterpret; such as thinking we are hungry when we are actually thirsty. Drinking a glass of water will not only keep you hydrated, but even if you are hungry, you will eat less because your stomach is full of water. Cancer Prevention - No, we aren't kidding. Studies show that keeping the body hydrated can reduce your risk of bladder cancer by as much as 50 percent and colon cancer by as much as 45 percent! The American Cancer Society says that water can also help to prevent breast cancer (PDF). Those are numbers worth drinking to! Improve Performance - Since our muscles are made up of almost 75 percent water, it's only obvious that staying hydrated means better performance in the gym. When we are dehydrated, it's not uncommon for people to feel fatigued, dizzy, or weak when trying to exercise. Less Joint Pain - Water keeps cartilage soft and hydrated. In fact, if you are taking Glucosamine for joint pain, you should know that this is how this supplement works; it helps your cartilage absorb water. When you are dehydrated, that Glucosamine you are taking can't do its job! Keeps Skin Healthy - Think of your skin as the peel on an apple. If you left your apple out in the sun for several hours a day and just waited for a few weeks, what do you think that apple peel would look like? Yep, soft, brown, and wrinkled. Put that apple in some ice water for a few hours and, while you can't turn back time, water will make it plump up and look far better than before! The skin on the human body is very much the same way. Stay hydrated for younger, firmer looking skin. Before You Eat - DRINK! You might think that drinking water whenever you feel like it will do the job, but did you know that there is actually a particular time of day when you really need to drink water? Although we like to think of ourselves as our brains and sparkling personality, the truth is, we are nothing without our digestive system. If we cannot eat or digest food properly, nothing in our bodies, including our brains, will work. Almost all of our internal organs are designed for the digestion of food. The minute we start thinking about food, our bodies get ready to receive it. The stomach starts to make some gastric juices, the pancreas sends a little spurt of insulin, the mouth starts to salivate, and preparing to break down that food you are thinking about. The problem arises when we don't have enough water in the body to run all these systems. Every single cell, every single function in the body, needs water to operate, and plenty of it! Your stomach is lined with very special cells which prevent it from being burned by the very acidic gastric juices it needs to digest food. This lining of mucus is made up of, you guessed it, water. Between 90 to 98 percent water, to be exact. This thin layer of mucus naturally creates its own source of sodium bicarbonate, which neutralizes the acid if it penetrates the layer. Now imagine that the stomach cells cannot release enough water to keep that protective mucus layer in place. This is what leads to stomach ulcers and stomach upset. Your stomach will work on your meal anywhere between one and three hours, depending on what you consumed and how much. Finally, this broken down food, called chyme, will empty into the duodenum, which is the very first opening into the small intestine. Actually, it is your small intestine, not the stomach, which does the majority of work breaking down and absorbing the nutrients from the chyme. This process will take about another 24 hours. It's fairly obvious from the above description how important water is, not only for maintaining the protective lining of the stomach, but for the intestines to break down food and deliver the nutrients that the body needs. Drinking water during or after your meal is a good idea, of course, but it won't be enough to help the stomach build that protective mucus it needs before you start eating. It also won't be enough to lower the pH of the stomach, since water alone will not neutralize acid. This is why you must drink at least a half a liter of plain water about 30 minutes before you plan to eat and not drink during or after a meal for at least two hours. By drinking with your meals, or soon afterwards, you dilute the chyme, making it thin and watery. Ensure you have adequate salt and potassium intake for correct hydration! Let's take just a moment to talk about the importance of salt, potassium, and water in the body. No matter how much water a person might drink, if the body is low in sodium and potassium, the water will not stay in the body long enough to make much of a difference. Salt's natural role is to regulate water in the body, keeping some water out of the cells. 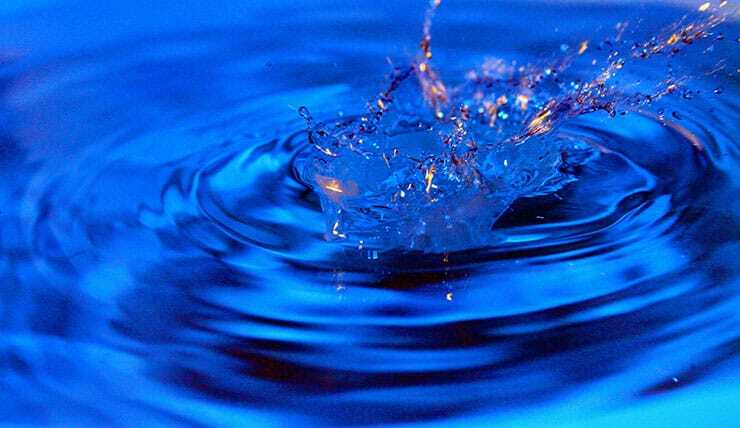 Potassium is what keeps water inside the cells so they can perform their function. 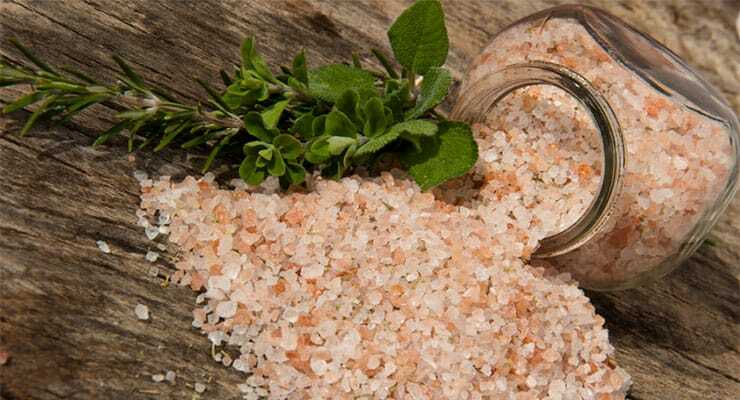 The perfect balance is to consume plenty of water, adding a bit of natural salt (not refined white salt, such as commercial table salt but unrefined natural salt like Himalayan Salt. We recommend Sherpa Pink Gourmet Himalayan Salt) to the diet, and eating plenty of potassium rich vegetables each day. 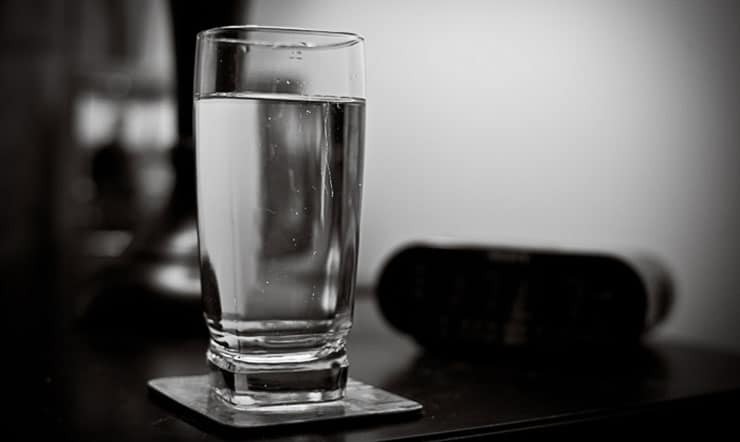 You've probably heard the old "8 glasses of water a day", but that number should be considered a bare minimum. For most adults, a sufficient amount is more in the area of two liters each day. This does not include soda, juice, tea, or coffee. This can be in addition to the two liters of water, but not instead of or in place of. Although things like coffee and tea are water based, they are not the same thing as plain water. Another good rule of thumb (since we aren't all the same size, correct?) is to drink half of your body weight in ounces of water, up to one gallon per day. For example, if you weigh 200 pounds, then you should be drinking about 100 ounces (3 liters) of water every single day. Find a container, a 1-2 liter bottle (CamelBak Chute 1L Water Bottle), with the number of ounces you should be drinking each day. Fill it with clean, fresh water each day and take it with you to work or keep it at home and refill a portable water bottle. You will know that you've consumed what your body needs when it is empty. Buy a stainless steel (Glacier Point Stainless Steel Water Bottle) or other type of refillable container and take water with you everywhere. Perhaps the simplest way to drink your water requirements is to make a habit of it. You can drink 500ml first thing you wake up, another 500ml about 30 minutes before lunch time, 1 liter about 2 hours after lunch. Another 500ml an hour before dinner and finish with 500ml one hour before bed. Eat plenty of raw fruits and vegetables, especially the kind that is made up of mostly water, such as celery, cucumber, and watermelon. Your urine should be clear or very, very light in color. If you will drink more using a straw, carry one with you. Investing in a water filter will keep the costs of clean water affordable.